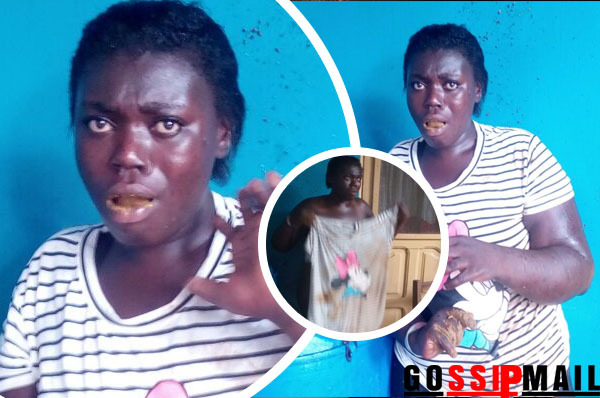 A suspected thief was on Monday handed the most callous treatment one can ever imagine when she was forcibly stripped naked by residents of Dichemso, a surburb of Kumasi and also made to eat human excreta. Gifty is accused of attempting to steal from a room at Dichemso. An obviously crestfallen Gifty said she lives at Atonsu but came to Dichemso for a routine errand but could not explain how she ended up in the room of one Christiana Ageiwaa, a tenant who lives in a house adjacent Fabulous Hotel. The angry mob who besieged the premises of the said house forced Gifty to eat human excreta which was wrapped in a plastic bag hidden in the hand bag she was carrying. According to residents that stunt of hiding excreta in their bags has become too familiar with residents who are consistently robbed of their valuables by thieves using that stunt. They claim that these ‘thieves” feign madness and rub the human excreta on their body whenever they are caught in order to get away with their crimes. As if that was not enough after subjecting her to the inhumane ordeal of forcing her to eat the human excreta in her bag, the angry youth stripped her stark naked. It took the timely intervention of personnel of the Airport Police Station to save her from the blood thirsty mob who were threatening to lynch her. Drama ensued when personnel of the Airport Police Station arrived at the scene because the suspected thief was drenched in human excreta and was stinking so the Police had to fetch water for her to wash herself in a gutter nearby before escorting her to the station for interrogation. Investigations are however underway by the Airport Police Station.